Specialist Tad Donoho screams with pain following being administered a 'pink belly' for his birthday. Each member of the platoon strikes his stomach until blood can be seen to rise, hence the name 'pink belly', demonstrating the Korengal Valley, Kunar Province, Afghanistan. July 2008. As soon as the gun is drawn, you know the trigger is being pulled. Once the rebel leader decides that the doctor is a government spy, you can see that he intends to get rid of him as quickly as possible. What do you do? As a photographer you’ve already seen plenty of executions in the bloody Liberian civil war, plenty of people dying on camera. This is nothing new. “I turned round and could see this happening and I thought ‘It’s gonna be another execution.’ So I turned around and got it in a wide shot,” said conflict reporter James Brabazon. His colleague Tim Hetherington, however, intervened. By getting involved, Tim did what many conflict reporters would never do. But Tim wasn’t like many other conflict reporters. 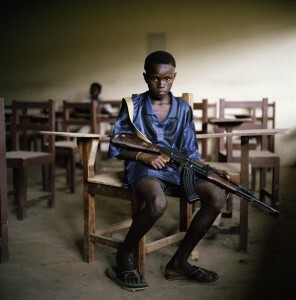 Tim Hetherington was an award winning British photojournalist and Oscar nominated film director, but he refused to define himself by any one profession. To his colleague James, Tim described himself as an artist. He cast off the typical passive role of the photographer, and embraced an acute awareness of the effect that his presence had wherever he worked. Tim was killed in Libya in 2011. He was fatally injured by shrapnel from a mortar round when he returned to the frontline after a day covering heavy fighting alongside rebel forces. He was forty years old. Three other journalists were killed, along with several Liberians. Shortly after Tim’s funeral, in an effort to understand the circumstance of his death, Sebastian Junger began to interview people. “The genesis came from wanting to understand ‘what’ and ‘why’,” producer James Brabazon said. ‘Which Way is the Front Line From Here? – The Life and Time of Tim Hetherington’ is a snapshot of one man and his career, presented through footage, images and interviews with his close friends, family and colleagues. 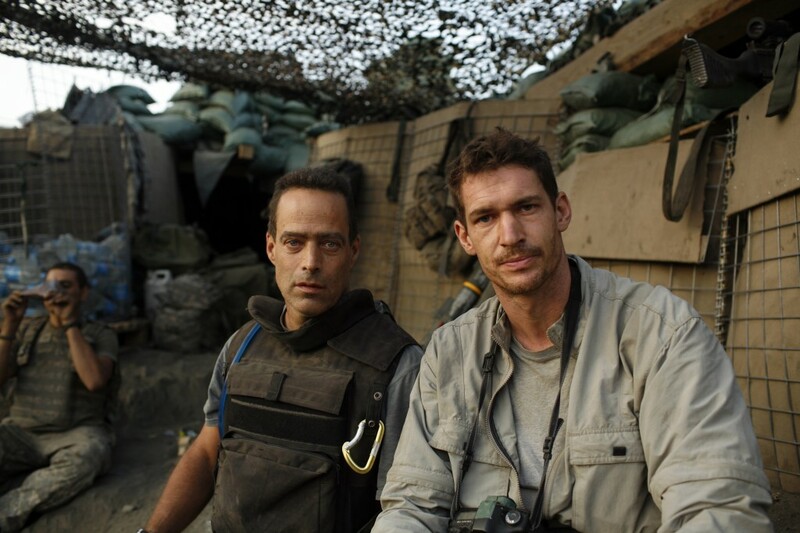 Writer Sebastian Junger (left) and photographer Tim Hetherington (right) during an assignment for Vanity Fair Magazine at ‘Restrepo’ outpost. James Brabazon spoke with The College View ahead of the film’s second screening in DCU this week as part of the Suas Educational Development 8×8 Documentary Film Events. “Tim never believed that it was possible to separate himself from his work. He believed very much that if you are there taking people’s pictures, your presence is an inescapable fact of the image you are creating. You are, by your very nature, affecting the outcome of the image,” James said. Tim’s work was focused on engaging with both the subjects of his images and the viewer. In the documentary, he describes his drive for personalisation and his desire to focus on individual victims of the disasters that he covered. Tim used specific types of cameras that he could look down into so that he would not break visual contact with the people he photographed. Young male fighter shows off his nail polish. Tubmanberg, Liberia. June 2003. 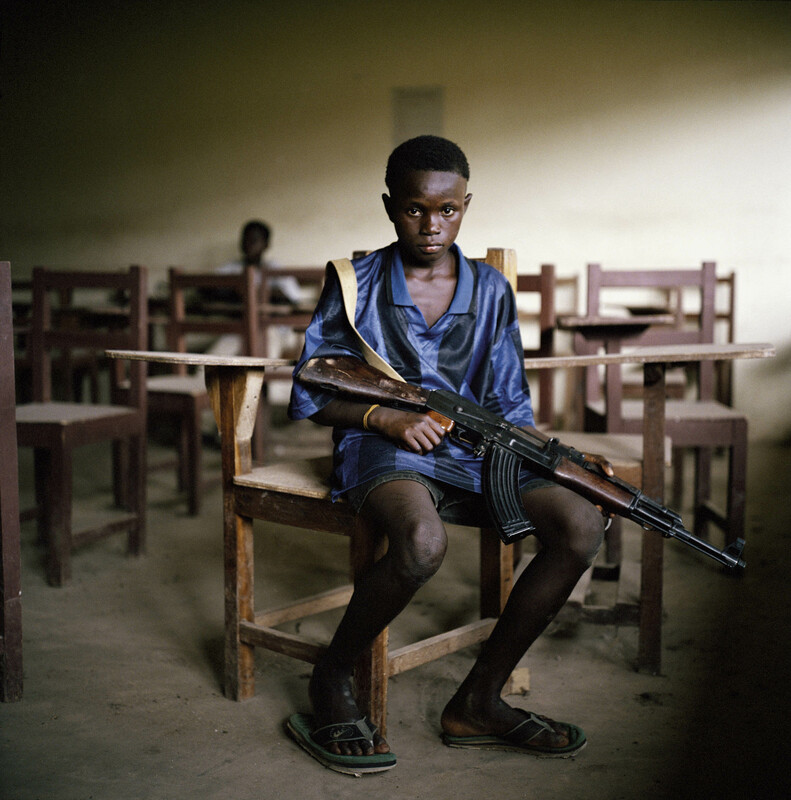 A photographer who admitted to having no interest in photography, Tim spent 8 years working in West African societies as a humanitarian of sorts. Among memoirs of Tim’s life and career, issues arose about how war is covered and the value that society places upon such coverage. “We need to be clear that what the film isn’t, is a definitive statement on Tim’s career and life. This is a snapshot, if you like, of him and his career, but it’s a very in-depth portrait of his work in war,” James stated. He also regrets the abrupt ending of Tim’s work in Libya. The photographs Tim had taken up until his final day in Libya are the early stages of an unfinished experiment, James said. Footage from Tim’s co-directed film ‘Restrepo’ showed the companionship that is developed among American soldiers at war in Afghanistan. This close bond is also developed among embedded reporters. It’s a strange phenomenon, James said. Specialist Tad Donoho screams with pain following being administered a ‘pink belly’ for his birthday. Each member of the platoon strikes his stomach until blood can be seen to rise, hence the name ‘pink belly’, demonstrating the ‘strange companionship’ of wartime soldiers. Korengal Valley, Kunar Province, Afghanistan. July 2008. Through his experience of losing Tim, Sebastian says learned the core truth of war – you are guaranteed to lose your brothers. Death and danger is a threat that you cannot think about all the time, James said. Instead, he focuses on the present; all while taking conscious steps to ensure his survival. However, fears can sometimes be unavoidable. To deal with times of doubt, James maintains a focus on his job. “I just keep working,” he said. The appeal of conflict reporting is very personal even though it may be fundamentally irrational, James said. He recognised his talent for war reporting, and appreciates being in a “luxurious” position of forging a career from that flair. In the Channel Four film ‘Al-Bayda: anatomy of a war crime’, James investigated the massacre of at least 169 inhabitants of a Syrian village in May this year. He sourced eye-witness accounts of the executions of men, women and children by government forces. The massacre was denied on Syrian state-television. James expressed a hope that viewers will appreciate Tim’s mantra that the act of witnessing is not enough. Photographers, Tim stressed, need to be aware of both their rights and responsibilities. This is something that can take a lifetime to understand James said. Coming to see the film, he maintains, could mark a starting point for that realisation.